Eye health is a key part of maintaining overall health & wellness, which includes scheduling your annual eye exam. If you wear contacts or eyeglasses, checking your prescription annually is necessary in order to maintain optimal vision. 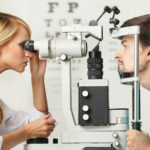 Even if your vision is crystal clear, regular eye exams can catch early symptoms of eye diseases, developing vision problems, and other unusual symptoms. Remember: the eye is an organ, and like all our organs, is ever-changing. Vision problems can develop at all stages of life, and scheduling regular exams can help catch any changes to your sight and maintain good eye health. We welcome and invite you to give us a try! We are committed to providing an excellent experience for every patient that walks through our doors. Don’t believe us? With over 1000 reviews for both Christiansburg and Salem, our current patients speak for us! And if you love us, be sure to refer your friends and family as well; deepening our roots in the New River Valley is our continuous goal.